For those of us who don’t live in a perpetually hot and sunny climate, the weather plays a sizable role in how we run outside. Many up north during winter condemn themselves to the limits of the treadmill, with its varying benefits and drawbacks. But many either don’t have or refuse to use a treadmill, and need to work with what nature gives us. I live in Chicago and do all my running outside. This winter in particular started out very mild and stayed that way until mid-January… when suddenly: Heavy snowstorms, -50°F windchills, perpetually icy conditions, brutal windstorms, unpleasant cold rain that the frigid temps made sure to ice over afterward, and so on. This obviously affected how much running, and what kind of running, this region’s people can do outdoors. This is nothing new. Chicago weather’s just as important a factor during summer. When Chicago weather gets hot and muggy, or we get the occasional severe storm, that changes the scope of any outdoor training workout. In some cases, it limits how much time you can spend outside (some will run through it but there’s a variety of reasons I avoid running in substantial rain, plus unless you like being an electricity conductor you should never run when there’s lightning). In most cases, it affects your performance, how much hydration you need, etc. It occasionally surprises me how taken-aback locals are by incoming severe weather, before I realize I pay closer attention to day-over-day forecasts than most people. Whether you run or not, you honestly should review the weather forecasts every day and know in advance what weather and temperatures are coming. Weather should rarely take you by surprise. One thing I find annoying is right before a relatively warm race when the obnoxious race emcee says, “It’s a perfect day outside for a race!” You can clearly tell from such a statement that the guy never runs, ever. Because while 60-70°F (15-20°C) feels amazing if you’re out for an easy walk, or laying out in the sun… that temperature enters the somewhat-warm zone for distance runners in a race, who are moving a lot faster than a walk and producing a lot of body heat throughout their run. Add in substantial humidity, which interferes with the evaporation of sweat, and now it begins to feel really hot. Jonathan Savage created a ‘perceived heat index for runners’ calculator to accurately show what a runner’s “heat index” is for a given pace at their height and weight, depending on the temperature and humidity. All temperatures are in Fahrenheit (the calculator on the site can be adjusted to Celsius). As you can see, 65°F (18°C) at even a mild 40% humidity can feel like 101°F (38°C) for a runner my size (5’10”, 160 lbs) running at a 9:05/mile pace. To be fair, that’s mild compared to how most of the summer has felt for me, running in 80-95°F (25-35°C) afternoons with 60-75% humidity. Even running at slower paces, my heat indices this summer have been in the 130-145°F (55-60°C) range. Needless to say, that prepares me fairly well for the worst heat the Chicago Marathon could offer me. 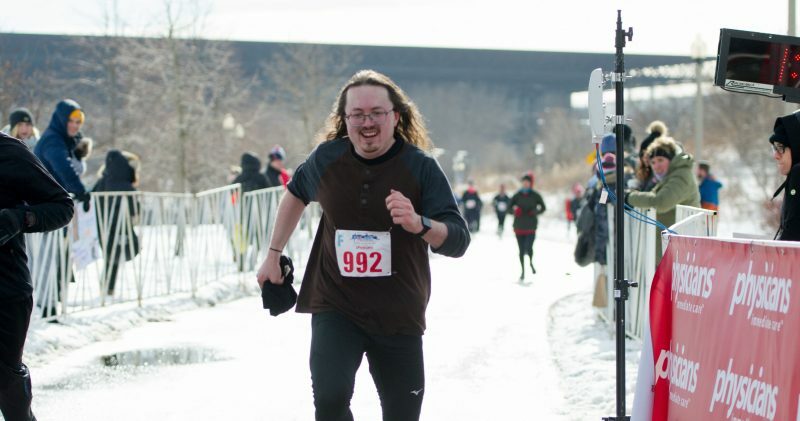 In any case, I’m not big on clapbacks or “educating” people, but the next time someone attempts to point out that 60+°F weather (15+°C) is perfect running weather, you may want to throw some knowledge at them about how running changes everything. What is the dew point, and why does it matter? Having lived in Chicago since 2014, I’ve not only experienced the gamut of weather (from frigid cold to stifling triple digit heat), but I’ve discovered the nuances of summer dew points and how they factor into humid conditions… not to mention affect your running. What is dew point and why does it matter? The dew point is the temperature at which water vapor condenses into physical liquid or solid condensation (dew, frost). For example, in winter you see frost when the temperature falls below the dew point at a given time, e.g. if the dew point is 31 degrees you’ll begin to see frost once the temperature is 30 degrees Fahrenheit or less. However, dew point becomes a more important factor in hot weather. As the air humidity rises, typically so does the dew point. You will tend to notice stickier, more humid conditions when the weather is currently at a higher dew point. The more humid the air, the less cooling benefit you get from sweating due to the air already being full of hot moisture. This can exacerbate the overheating you experience during exercise as the compiled sweat plus may ironically provide an added seal for your internal heat. This didn’t matter to me for most of my life. Growing up in the dry desert of Las Vegas, I typically never saw high dew points, and rarely did the temperature drop low enough to trigger dew or frost. Living in Seattle for 10 years, while it did get warm during summer, the dew points typically never exceeded the 50’s Fahrenheit. While we would see frost or dew during winter, when the dew point would drop to the 30’s, it rarely got seriously muggy. Chicago is where life with summer humidity got serious for me. And after I recently learned more from Jonathan Savage about the effects of heat on running, I realized that dew point provides a loose but reliable barometer of how the humidity affects you, not to mention your running. Runner’s World first published a primer on dew point’s effect several years back. While their scale is general and crude it does provide a reliable barometer for how uncomfortable the outdoor heat can feel. And yes, the actual temperature is important (a dry 105 degree day in the desert may have a safe dew point but obviously 100+ degrees is still dangerously hot), as does your physical condition and how acclimated you are to current temperatures. A typical Chicago day, regardless of true temperature, sits at a dew point in the 60’s. Low 60’s is (provided acclimation) reasonably comfortable, even if there’s enough humidity to soak through your top. The mid to high 60’s is where any amount of extended activity begins to overheat you more quickly. And once the dew point reaches the 70’s, that’s some seriously uncomfortable humidity. Nowadays when I look at the weather report (something I’ve done religiously throughout life, because I commute on foot and run a lot), I don’t just look at rain forecasts or temperature, but I pay attention to the dew point. I may not be able to count on the wildly-fluctuating forecasts for high and low temps, but the trend of the dew point will tell me when it’s going to get real hot or cool down. Savage’s Perceived Temperature For Runners calculator is a great guide to how given conditions will really feel when running at a given pace for your frame. The temps this week may only be in the low 80’s, but for me running a slow-ish 11:00 mile pace the combination of heat and humidity feels like the equivalent of 140-150 degrees to a normal person standing still. If I think I need a break 30 minutes into a run in such sauna-like conditions, I’m probably right. In the most recent London Marathon, runners dropped like flies in 75 degree conditions, drawing derision from the general public since 73 degrees is supposed to be room temperature. How can runners struggle so much in room temperature conditions? Realize that when indoors we’re probably not exercising, let alone with any intensity. Even the “Feels Like” temperature provided in weather reports assumes a normal-framed person doing no more than walking at a normal pace of 3 mph. Of course 73 degrees feels comfortable if you’re just sitting down or otherwise hanging out. Once you’re running, you’re expending a lot more heat and energy, and suddenly even 50-60 degrees can feel uncomfortably warm. A 5’10”, 160 pound marathon runner running 8:00 miles would have felt the equivalent of 130 degrees running that pace in 75 degrees Fahrenheit with a reasonable 50% humidity. Add any humidity to that and it feels even hotter. It’s no surprise that runners indulged on fluids so heavily that the race organizers ran out of water, which exacerbated the dangerous conditions further. A general rule of thumb given by many when running is to take whatever the temperature and assume you will feel 20 degrees warmer. I’ve found this to be true, especially in winter where I’ve gone for outdoor runs in 0-20 degree weather and felt perfectly warm within a couple miles. Expending significant energy to run does heat you up considerably. Your perfect 70 degree weather as a sedentary pedestrian can become very dangerous once you go on a simple run. But I digress. Not every 70 degree run is going to feel equal. But the dew point is going to give you a more nuanced idea of how it will feel, and how you should plan to run it. As the Vancouver Marathon approaches I’ve kept an eye on the 10 day forecast, not so much for any inclement weather on race day (Vancouver’s climate is mild and chances are good it’ll be clear), but to monitor the likely temperature. This marathon will already be difficult enough on its own, but the effect of any excessive heat will magnify multifold as I enter uncharted territory in the later miles. The forecast already called for mostly clear skies and temps over 60, but as days pass the forecasted high temp for race day has grown and now sits at 71’F. The forecasted temp at gun time is currently 60’F, and given my anticipated pace I will likely finish during the 12pm-1pm hour, right as the heat begins to peak. The London Marathon felled countless runners not too long ago as temps reached 73’F, and not a few people scoffed at runners collapsing in a temperature we’ve been so conditioned to believe is perfectly comfortable that we set thermostats there as a default. Such opinions are clearly the product of people who don’t run regularly. A key reason we’re advised to dress in winter as if it’s 20 degrees warmer is because your core temperature while running will increase to a point where it feels at least 20 degrees warmer. This remains to some degree true once the weather warms up, and greatly exacerbates the effect of outdoor heat. You are after all elevating your heart rate and burning about 90-120 calories per mile… and your body when in continuous motion produces heat. Cold can feel normal. Normal feels hot. And any temperature above normal can get dangerously hot. I recall running the Soldier Field 10 last year, and even though the temperature never got above 62, I began to feel overheated in the later miles. Pacing and other factors (plus the distance at the time) may have contributed, but I do recall feeling substantially hotter at the end than past races. I felt weak at the time for having been so affected by such seemingly mild temperatures, especially when racing calculators like the Daniels Tables indicate that’s barely above the threshold (60 degrees) at which heat begins to affect you. Looking back now, knowing that heat can begin to affect you at 50 degrees, I now realize that I wasn’t too far out of line. If we follow the winter wear 20 degree postulate, my body by that point probably felt like it was about 80-85 degrees outside. It’s little wonder that at last September’s Great Race 10K in Pittsburgh, where temperatures reached a race-historical high of 87, runners were collapsing and required medical attention at the finish line. I ran that race and had to physically stop between aid stations around mile 4 to avoid illness myself. I finished, but I passed many EMTs attending to fallen runners towards the end, and even watched another runner collapse to the ground amidst more EMTs at the finish line. For all of us racing, that 87 degree temperature felt a lot more like 105-110 degrees as we reached the finish. What’s beautiful weather for a bystander can be dangerously hot weather for a runner. That 60 degree start time temp at Vancouver may or may not feel hot when we start. But by hour 2, the likely 65 degree temps will feel more like 85-90, and it’s going to get worse as we enter the 10K marathon badlands of miles 20-26 (or for Canadians, kilometers 32-42). As the temps hit 70, it’s going to feel like 90, and if they run out of water in Stanley Park it’s going to get real bad for slower runners. So now my race planning requires another wrinkle. Never mind making sure I properly fuel and pace myself. I now need to figure contingencies for hydration in the later miles, just in case the compounding effects of marathon exhaustion and heat make the difficult potentially unworkable. Because the latter portion of the race will be at noon, there won’t be much shade as the sun will be directly overhead. And, because the later miles are along the Stanley Park Seawall, it’s not particularly easy to drop out if you must. Either dial back my overall planned pace by about a minute, or do the classic racing no-no of banking time at my original planned pace early, then dialing back the pace for good once the heat becomes noticeable, to minimize my exposure to the worst of the heat. String to my running belt my running cap and perhaps a towel/cloth of some kind, for cover. The cap can be wet as needed. I could also pin my bib to my shorts, begin the race with a tech T over my singlet, and remove the T to use as a towel in lieu of a towel. Aggressively top the water bottle off before entering the park at mile 20 (32K). Absolutely stop and walk/rest through aid stations. I’m still fairly confident I’ll finish Vancouver as expected. This is all just part of the planning that I was already setting in place for a tough race. But it speaks to a greater point: Don’t underestimate the effect of the heat on your running. The harder your feet hit the ground, the quicker you’ll get tired and the more you will hurt. You’ve got to eat like a bodybuilder: A whole food minimally processed diet anchored by lots of clean protein. Sleeping well matters a LOT more. The quicker your feet can step during a run, the easier keeping a faster pace will be. In cold weather you will warm up after 20 minutes of running. To race great you have to go out slower than everyone else wants to, and resist keeping up with them. If you take advantage, life will give you lots of opportunity to practice running in little bursts. If you can comfortably run in them, lighter and less-cushioned shoes feel better. If your body can handle it, walking and weight training will not only make you stronger but help you heal between workouts. You’ll know by feel when you shouldn’t use a pair of shoes for training anymore. Perfect temperatures can actually be too hot for running. Most people don’t understand the importance of fueling during long runs. Most people over-fuel on shorter regular runs. Big races are overrated, and consistent high-volume training is underrated. Most people do their easy/regular/recovery running way too fast and hard. If someone runs or bikes close to you on an empty path, they’re intentionally harrassing you. Beginning runners try to do too much right away.